New Liberal Leader Justin Trudeau started work in the House of Commons today as Conservative attack ads appear on YouTube in English and French. There was no day off to celebrate for Justin Trudeau, who won the Liberal Party leadership decisively Sunday night with more than 80 per cent of the vote. Before Trudeau's first full day as leader had even begun, attack ads against him appeared on at least one television network and radio, as well as on YouTube in English and French. They show Trudeau at a gala for the Canadian Liver Foundation in 2011 called "What a Girl Wants" taking off his shirt and striding back in forth in a sleeveless undershirt. Interspersed through footage of the shirtless Trudeau, his hair long and flowing then, are clips of him suggesting that Quebec ought to become a country, or that Quebecers are simply better than everyone else, or that the word "barbaric" is inappropriate to describe violence against women. The voiceover in the video suggests Trudeau has no judgment. It ends with a slow-motion sequence of Trudeau sighing and tossing his head, and then an animated signature of his name appears, drawn in stardust in a cartoonish way that caricatures the handwriting of a young girl. The announcer voice intones that Trudeau is in "way over his head." Asked in an interview with CBC a few weeks ago how it feels to be belittled (the new Tory ads aren't the first time Trudeau has been mocked), he said: "I've had people do that to me all my life. People, all my life, conclude things about me based on perception, based on prejudice, based on expectations that have nothing to do with reality." Trudeau's appearance at the event — in which he removed his tie, jacket and shirt while participants bid for the right to go on a lunch date with him — raised $1,900 for the Canadian Liver Foundation. Asked about the fact Trudeau was participating in a charity fundraiser, Conservative Party spokesman Fred DeLorey replied in an email, "We believe Justin Trudeau's eagerness to perform a strip-tease, regardless of the venue or putative cause, says something about his judgment." Trudeau did the same kind of performance a year earlier in 2010, again for charity. One of the people who attended that event was Laureen Harper, wife of Prime Minister Stephen Harper. Minister of Labour Lisa Raitt was also present. Raitt told reporters Monday that while she supported the event, Trudeau's conduct showed a lack of judgment. "You wouldn't see me making that move, getting up on a walkway and taking clothes off in front of a bunch of men or women." "What would be the conversation today if that was a female MP who had done that in a room of men, guys, why don't you think about that?" Raitt continued. In question period Monday, Trudeau questioned Harper for the first time as leader of the third party in the House of Commons. Trudeau started off strongly in French, but the House of Commons translation service wasn't turned on and the Speaker stopped him in mid-sentence. He seemed thrown and had to read the question from his notes. By the time Trudeau switched to English, he seemed to have found his rhythm again, asking about tariffs introduced in the government's spring budget that levy extra costs on goods such as bicycles. Trudeau hit on certain themes: the middle class, families, children and, in a likely retort to Conservative attack ads that pilloried him for his judgment, he questioned Harper's judgment. "So now that the prime minister knows what's in his budget will he show good judgment, admit it's a tax, and repeal these taxes on middle-class Canadians?" Trudeau demanded. He also invoked an image that might become as ubiquitous as the NDP's charge of an "iPod tax" — a tariff hike on "little red wagons" for children. Harper repeated the same answer to each question: that his government has lowered taxes and that what the Liberals want is a break for emerging economies, particularly China. A few weeks ago, a shaky Trudeau filled in for the then interim leader Bob Rae, and asked Harper questions, reading from notes and barely lifting his head. Harper, however, when he stood to answer Trudeau, seemed uneasy as well and twice began sentences by calling Trudeau a "minister" before he caught himself. Trudeau told CBC he was nervous during that exchange, having never done it before, and that he intended to get better. After question period, Trudeau faced reporters in his first scrum as leader. Asked about the attack ads, he told reporters that people across the country have told him they're sick of the Conservatives' "bullying, negativism and cynicism," and that he intends to continue with what he calls his positive message. He added that since he was 4 or 5 years old, he's had "a microphone stuck in my face," and he's sure the Conservatives will pick through what he's said over the years. As for some of the remarks highlighted in the ads, such as the assertion that Quebecers are "better," Trudeau said, "I've learned better ways of expressing myself." 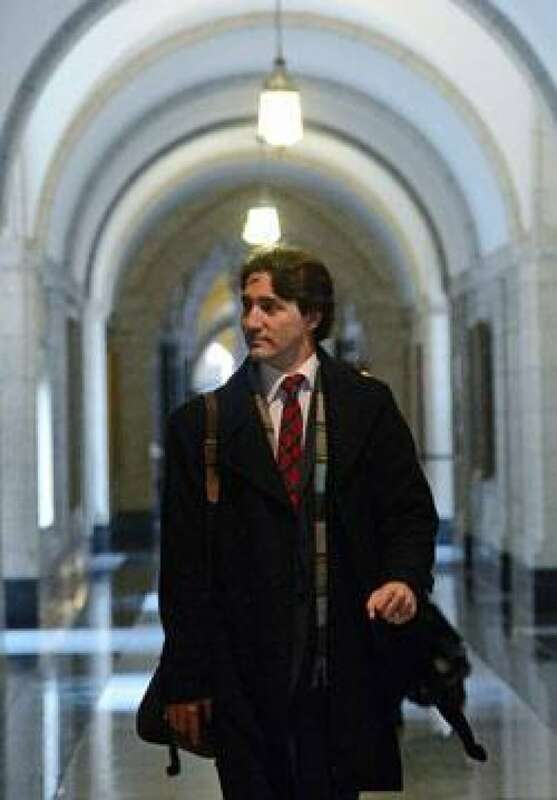 Trudeau said he's already chatted to former interim leader Bob Rae about a future role in the caucus, and he intends to speak to fellow leadership candidates Joyce Murray and Marc Garneau about what their critic roles might be before Wednesday's Liberal caucus meeting. The one MP to whom Trudeau may owe a debt is Rae, who is credited with keeping a severely demoralized party together during the past two years. It's said that Rae might prefer to be the foreign affairs critic, a post currently held by Trudeau's old friend Dominic LeBlanc. Rae, however, has just undertaken the responsibility of becoming the negotiator for First Nations in Ontario on sustainable development issues, and he may be too busy for a demanding position in the Liberal caucus. Trudeau also told reporters he was less nervous during this question period although he says he saw it as a hurdle to be overcome, and added that he'll be doing many more in the months and years to come. This story has been edited from an earlier version that incorrectly stated Laureen Harper was at an event depicted in a Conservative ad directed at Justin Trudeau. In fact, Trudeau and Laureen Harper were both at the event the previous year.